The charts linked below allow you to compare schools and districts in Colorado with their peers. 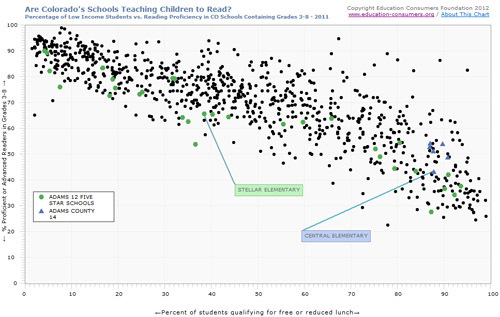 The Y (vertical) axis shows the percentage of proficient 3rd graders in a subject; the X (horizontal) axis shows the percentage of students who qualify for the free or reduced rate lunch program, a common indicator of poverty in schools. Note: For a small number of schools in Colorado for 2015, proficiency was reported with a less than (<) or greater than (>) sign in front of the proficiency percent. These signs were removed for graphing purposes. Note: Colorado proficiency scores for the 2011 and 2012 chart’s are for the entire school, not just the 3rd grade.